The folks at StudioPress have been busy. Not only are they continuing to expand their count of freshly designed Child Themes, they are also pushing out redesigns of existing Child Themes (starting with the most popular ones) to keep them current. They have also released the theme Marketplace for 3rd Party Child Theme developers to sell and promote their themes. All of this has led to an increase in exposure and recognition among the designer developer community, and to some degree among the “rest of us” as well. The challenge for the typical user (of which I put myself in that camp) is that we lack the tools and understanding to really appreciate the advantages that the platform brings. 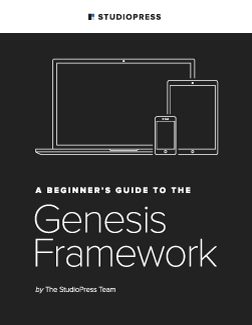 As I have shared before, I exclusively use the Genesis Framework for WordPress for all the sites under my control, and I strongly encourage my friends, family, or well pretty much anyone to consider using it. The challenge with WordPress and any theme in general is that there is a fairly steep learning curve. In the case of the Genesis community, there is a great forum and tutorials all for solving specific design or function desires, but nothing (well, nothing really) has started off at the beginning, until now. Two members of the StudioPress (Copyblogger Media) team have written the missing resource, Nick from NickTheGeek.com and Andrea from WPEbooks.com. This is what every new or prospective Genesis user should read before installing and configuring their site. Since this is a FREE (non opt-in even) eBook, I am going to stop talking now and just send you over to download it. Myself and a few other brave souls have been busy creating a few other resources for the Genesis User Community. In many ways these are the resources that I wished had existed when I started with Genesis (Feb 2011). When working on a site design for my wife, I realized that there were a lot of Child Theme developers out there, but were buried way down there on a Google search. So I made and curate a list of All Genesis Child Theme Developers. Some very generous developers have taken to releasing free Child Themes (You just need to purchase the Genesis Framework to run it on). At the time there was no unified list of all the free Child Theme options. So I made and now curate a list of All Free Genesis Child Themes. Developer Josh Staffer maintains a similar list of Free Themes, and have even created and released two of the Free Child Themes. Nick “the geek” (co-author of the Beginners Guide to Genesis) created his Child Theme Comparison Tool.